"Serving the Family for Generations"
How do I request veterans' funeral benefits through Layton-Anderson Funeral Home? What types of funeral benefits are available to veterans? Depending on the chosen final arrangements, specific funeral benefits are administered by the Department of Veterans Affairs (VA), or by the state in which the burial or inurnment takes place. What is a burial allowance? The VA or the state will pay some of the expenses incurred in the burial of our country's veterans. Not every veteran's funeral expense is covered, although most of the normal expenses you might incur will be reimbursed. VA burial allowances are partial reimbursements of an eligible veteran's burial and funeral costs. When the cause of death is not service connected, the reimbursements are generally described as two payments: (1) a burial and funeral expense allowance, and (2) a plot or interment allowance. Who is eligible for a VA burial allowance? What specific funeral benefits and burial allowances does the VA provide? As of July 14, 2014, for deaths occurring after Oct. 1, 2011, the burial/funeral and plot/interment allowance has been increased to $734. How do you apply for these benefits and allowances? You will need to attach a copy of the Veteran's military discharge document (DD 214 or equivalent), death certificate, funeral and burial bills. The bills should show that you have paid them in full. 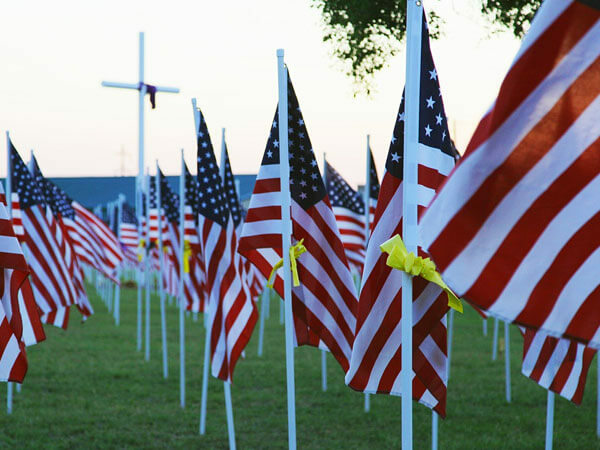 Layton-Anderson Funeral Home will be glad to assist you in filing for veterans' benefits. Please contact one of our funeral directors to let us know how we may help.